On December 1, 2012 Microsoft releases the new Office 2013 suite for developers and companies. Then the well-known programs Word, Excel, Outlook and PowerPoint are available in a fresh style with new features. 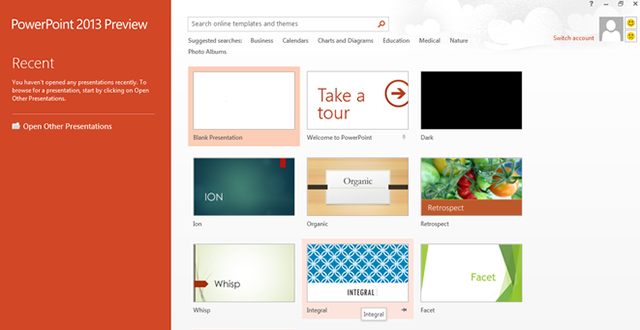 We show you where Microsoft strikes a new path and what’s innovative about the new PowerPoint 2013. After creating an account with Microsoft you can directly work on files while the new streaming technology is installing the Office 2013 suite in the background. You will notice that the Office 2013 surface has a completely new design and is set up for 16:9 screens. It is geared to the Windows 8 design and also uses the Modern UI which means that Office 2013 is now optimized for the mobile devices with touch-screens. Due to the cloud service SkyDrive you have worldwide access to your files from every web-enabled device and you can easily edit them. Office 2013 is connected to social networks like Facebook or LinkedIn. This will allow you to easily check the latest news and status updates via Outlook. Let’s talk about the new features of PowerPoint 2013. The recent version starts with a new front page offering a selection of various designs and color schemes. Every user has the opportunity to load up and share own templates. Thus Microsoft has made PowerPoint a sharing platform which is definitely one of the steps to optimize networking around the presentation program. It’s even possible to publish presentations as videos, for example in social networks like Facebook or on YouTube. For more infotainment you can enhance presentations with background music or videos. Sharing thoughts has never been easier with PowerPoint 2013. Now several users can work together on one document from different computers. Therefor Microsoft introduces a pinpoint commentary function. These new features are very helpful for business people connecting and working all over the world. All files are storable and visible online and can also be checked and edited in a web browser if Office 2013 isn’t installed on your computer.